Lama Chuck Stanford is moving on from his post at Rime Buddhist Center, but his legacy will remain. Lama Chuck Stanford is standing just inside Kansas City’s Rime Buddhist Center on a frosty Sunday morning in late December, urging the morning’s volunteer greeter to come in from the cold. She can welcome people once they come indoors, he says. It’s what other greeters do. As visitors arrive to the entryway of the 125-year-old building in Kansas City’s core, they leave their shoes in cubbies, then walk past a table with tea offerings near the bookstore and gift shop toward a table with katas – white scarves. Everyone takes a kata as part of a gratitude ceremony to recognize Lama Chuck’s final Sunday service at Rime. Incense permeates the stillness as people fold their legs and sit on red cushions and mats used for meditation. The only noises are those of sock-footed kids attending class in the building’s loft. With the close of 2015, Stanford has just stepped down from his position as leader of Rime Buddhist Center. During his 20-year tenure Rime’s influence grew from gathering a few souls at a community center to being seen as a dynamic force in Kansas City’s religious community, while providing an accepting spiritual home for the metro’s less fortunate, including the homeless and the incarcerated. Like many who find their spiritual home later in life, Stanford lost interest in his Christian upbringing as a teenager. Feeling that something was missing, he explored other religions. Some years later he was taking a yoga class and the upstairs had a Buddhist shrine and meditation cushions. “I started attending, and I found I liked the Buddhist world view very much,” he says. He envisioned a place where like-minded people could meet, so he and his wife, Mary, rented a room at Roeland Park Community Center in the early 1990s. Stanford was running an event-planning business and invited other people to a non-sectarian Buddhist gathering. Soon they were holding meditation sessions and classes on Buddhism in what at first was called the Mindfulness Meditation Foundation. The name later was changed to Rime Buddhist Center and Monastery and Tibetan Institute of Studies. The renowned Tibetan teacher Orgyen Kusum Lingpa asked to ordain Stanford as a Lama in 1997. Stanford’s name as a Tibetan spiritual leader is Lama Changchup Kunchok Dorje, but he has always preferred Lama Chuck. Stanford has made many trips to India to receive lessons from the Dalai Lama and to Golok, Tibet for further study. Rime Center opened at its present location at 700 West Pennway, in the western Crossroads district, in the year 2000. These days, several hundred people attend classes, services and workshops weekly, ranging from meditation to the basics of Buddhism and Tibetan language classes. Many know Stanford for his continued outreach to prisoners. “In the back of my mind I felt some fundamental attraction to do something with inmates in prison and Buddhism,” Stanford says. After volunteering at the state prison in Lansing, Kansas, he approached the Missouri prison system and discovered officials there did not recognize Buddhism as a religion yet. “We had to petition them and go before a board, and it took like two years,” he recalls. Friend and member of the GKCIC Fr. Michael Medis remembers Stanford’s good humor and distinctive laugh when he met him a decade ago. 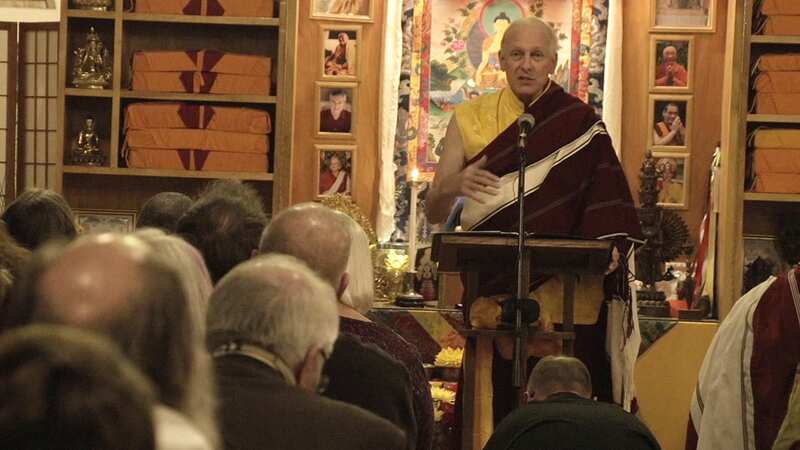 “He’s done a good job of making the Buddhist tradition — that Eastern part of it — accessible to American people, says Medis of St. Archangel Michael Serbian Orthodox Church in Kansas City, Kansas. He finds in his own Eastern orthodox tradition that people have an interest in what might be considered exotic. “People who have abuse in their life or given up on society want to go to something more ancient,” he says. Even Lama Chuck’s message for his final Sunday service, with a theme of choosing love over fear, featured cultural nods to wisdom from Yoda to Mark Twain to an “Extreme Makeover” reference. “I’m a Westerner and I am who I am,” Lama Chuck says when asked about the dichotomy. “I have to relate my life experiences. I think it works — don’t you?” he asks his wife, Mary Stanford. They both emphasize the meaning behind Rime. It means non-sectarian, and this inclusion factor was important. Following Stanford’s last Sunday service, the office is a flurry of activity. Volunteers are gathering chairs to set up for the New Year’s Eve meditation gathering in a few days. When Stanford leaves, Lama Matt Rice will become the spiritual director and Gabby Otto, chair of the board for many years, will handle administrative duties as executive director. The time was right to retire, says Stanford, who is 66. “Twenty years is long enough,” he says. He and Mary are planning a trip to Mexico with their family. It’s a tradition. “It’s like my Christmas gift to them,” he says. As the final Sunday service ends, those attending rise to their feet, take their ceremonial white scarves – the katas – in their hands, and form a line that snakes into the hallway. One by one they wait to offer their kata to Lama Chuck to show their gratitude for his two decades of service. Lama Chuck takes the kata offering, drapes it around the neck of the person standing before him, and then the two bow until their heads meet. This story is part of the KCPT and Hale Center for Journalism project “Beyond Belief,” a series of stories and discussions about faith and the different faith traditions in our diverse city. The project is part of Localore: Finding America, created by AIR, a Boston-based network of independent public media producers. Principle funding comes from the Corporation for Public Broadcasting. Learn more about “Beyond Belief” here. Chocolate Ale with Raspberry? That’s Our Jam.